It's just my opinion but I came across something that deserves further investigation. Has anyone researched the howls of wolves and compared them to BF vocalizations. You may be surprized on what you discover. My neighbor has a hybrid wolf/dog and the sounds he makes are almost identical to the recordings I have listened too. These are not coyotes. It's "one" individual making this long amazing vocalization. 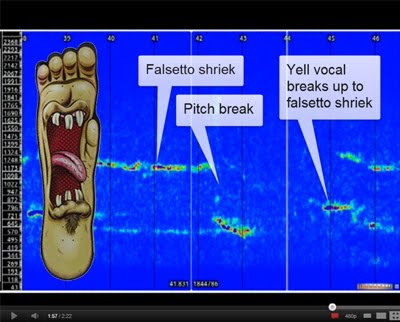 The gentleman who analyzed this vocalization is a former U.S. Military Cryptologic Linguist (simlar to Scott Nelson) who's specialty now is analyzing and documenting all bigfoot vocalizations. Over the past few years he has compiled a vast database of every sasquatch vocalization ever recorded. He can tell if it's a squatch, person, coyote or other animal. The screams are pretty good, however the rest is not to audible and I have bose speakers hooked up to my computer. Think I will get a good headphone. I only wish that when researchers are recording, they would just quit talking. Stan Courtney does a wonderful job of making recordings. I know "yotes" can make some odd sounds, and there are some dogs barking at the beginning(they are reacting 2 it). But this is not a coyote,wolf, nor elk. Go 2 the kentucky bigfoot site/allen county/full vocals. Put headphones on and turn it up. Esp. listen from 1:15 until the end, then come back and tell me that's a Canine. It is either the big hairy guy, or a insane human with a vocal range the 3 tenors can't imitate. I have an experience documented with BFRO and I have also owned a wolf hybrid. These sounds are not wolves or coyotes. When you hear this scream in the woods you will never forget it. I'm impressed by who ever recored this because they seem to have captured these creatures vocalizing like I have never heard before. Almost like there is a language of some type being used. I wish we could figure their tree knocking patterns. I know this is a Squatch. Its the same screams I heard as a child when I first saw it. I'm wondering if it's a female and a juvenile ? They almost sound like whales vocalizing in this recording. Also, I have heard before that they either make a sound like a hoot owl or they are attracted to the sounds. Does anyone know anything about that ? I live in nyc iam really interested in going out with a team and seeing and hearing these bigfoot. Phenomenon for myself anyone interested. the vocalization is made by something with a huge lung capacity, and is continuious for a duration of the clip, very chilling, makes me want to go ivestigate rite now! I have coyotees in the field behind me.This is what I hear every single night.this is nutz.